Project Rudolph Charity. Let's help out. I received the following email from Ray Archibald. He and his family have a great charity that I would like to support. 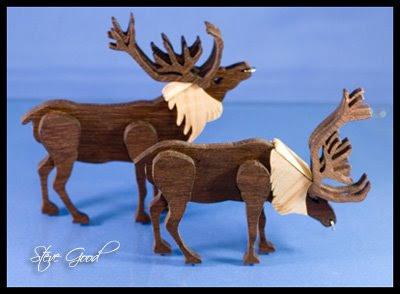 I would like to challenge all readers of the Scrollsaw Workshop to download and cut this ornament and send it to Project Rudolph. 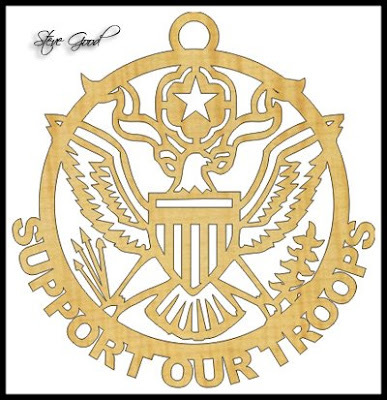 Our service men and women deserve our support. Christmas can be very lonely for the soldiers stationed so far away from home and family. Let's join together and make sure they know we care. I am looking for some help. Our family has a charity called "Project Rudolph" which began 2 years ago as my son's Eagle Scout project. Various grade school children decorated brown paper lunch bags and wrote letters to "Dear service member". In each bag was placed two children's letters, a letter from an adult as well as a candy cane some American and German candies and an 0rnament. These bags were then sent to our daughter who lives just outside Ramstein AFB, and Landstuhle Regional Medical Center in Germany. There, they were handed out to service members going through Ramstien during the Christmas holidays. Our son flew over to help assemble and hand out the bags. About 1500 bags were handed out at the Air Force base as well as to the Hospital at Landstuhle, to the Fisher house, and the Keebler Recovery Barracks. They also sent about 250 bags to Iraq and Kuwait. This continued the 2nd year and we were able to deliver about 4500 bags to Germany, Iraq, and Kuwait. My daughter Tawny Campbell has upped the anty to 7000 bags this year! We found that the most popular of the ornaments were the ones I cut out of 1/4" plywood and then painted and decorated.They fit easily into their ACU pockets and were quite durable. This is where I need your help. We are hoping to have all "Hand Made" ornaments this year, which means we need volunteers to help cut them out so they can be sent to Germany and added to the decorated bags. We also need all the letters we can get !! 22,000 of them!!!! If you can help us , please let us know. "Project Rudolph" is part of "Project TLC " and is a non-pfrofit 501 (c) (3) charity which is sanctioned by "America Supports You". You can read more about Project Rudolph at www.projectrudolph.homestead.com. When there, take a minute and read the responses in the "Guest Book" from the people who either helped with the project, or were recipients of the Gift bags. This is a great project for crafters of all kinds to be involved in, as well as church groups, scout groups, schools,and such. Please help spread some Christmas cheer to our service men and women this Christmas!! We also have put together a pdf file that explains things in more detail on ways people can help us give a little Christmas cheer to our Service Members both deployed and those who have been wounded. The length of this reindeer sleigh is 16". The reindeer are almost 6" long. 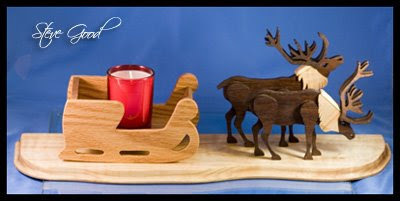 The sleigh can hold a candle or other item up to 2 3/4" deep. I did not include a pattern for the base. It is optional and you can just free hand cut the base. If you look closely at the closeup of the reindeer you will see that I placed a small metal ring in their nose. Once I find the appropriate reins I will tie them to the rings and over to the sleigh. For a more impressive presentation you could cut more reindeer with a lead dear like Santa's sleigh. This is actually a very simple pattern to cut. The hardest part is gluing the legs to the reindeer and make them stand up with all four hoofs on the ground.